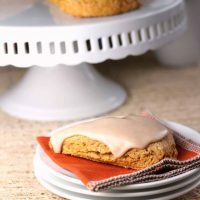 Fall flavors are upon us — pumpkins and apples come to mind– and these sweet pumpkin scones with a maple glaze will bring out fall in all of its glory; they will also rival any pumpkin scone you find at Starbucks this month. I found the recipe on Food Network and am happy to pass it along to you here today. You can change the combination of spices if you wish, even make your own pumpkin spice mix with cinnamon, ginger, nutmeg and more. Pumpkin baked goods are not just about the spice, though, you’ll want to bake with pumpkin puree from a can or freshly roasted pumpkin. I took the shortcut this time and used canned pumpkin so adding the extra spices was especially important. #BreadBakers are sharing our favorite fall bread recipes today and we’d love for you to join us. Thanks to Wendy of A Day in the Life on the Farm for leading the group this month. Preheat oven to 400 degrees F. Prepare a baking sheet pan with parchment paper. In one bowl combine the sugar, baking powder, all of the spices, salt and flour. Stir gently with a whisk to combine. Cut in the cold butter with a wire pastry blender (or two knives criss-crossing work well too) until the butter is about pea-sized. In a second bowl mix the pumpkin, egg and milk. Make a space in the middle of the dry ingredients into which you'll pour the wet ingredients. Fold in gently with a spatula until just combined. If your ingredients have warmed up such that butter is mushy at this point, gather the dough into a ball, flatten into a disc, wrap in plastic wrap and cover in the refrigerator for 30 minutes. Flour the surface and the dough lightly then push with your fingers or roll out with a rolling pin into a circle about 8 inches in diameter. Use a floured knife to make cuts in dough to form 8 triangles (like spokes on a wheel or slices of a pizza). Place on the parchment lined baking pan, spreading the triangles back a bit to give each room to grow while baking. Bake for 20-22 minutes (this is a lot longer than time on original recipe but I found it necessary in my oven) then remove and let cool on the pan. When you are ready to add the glaze, whisk the confectioners' sugar, pure maple syrup and cinnamon together. Spoon over each scone. A double fall treat with pumpkin and maple flavors. Wow Holly I would love to try these with a hot cuppa tea 🙂 That maple-cinnamon glaze looks fabulous! There are some lovely recipes coming from your group this month. As for Starbucks . . . I’d much rather have yours instead. These scones look delicious! I would love one with my morning coffee! Simply GORGEOUS! 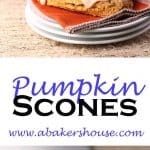 I made 150 pumpkin scones last month for a friend’s wedding and if I had had your recipe before I would have totally used the maple frosting on top. It brings the Ooomph factor to another level. wish I could taste one with coffee. Pumpkin and Maple…perfect Fall Flavors. I would love one of these scones. 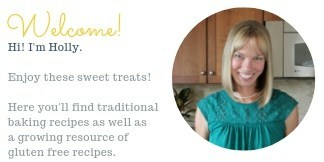 I am in love with your photo Holly, and the scones sound delicious!!!! Holly, one of my favorite scone recipes has a maple glaze and I adore it. Which means of course, that I would adore these, too! Can’t wait to try this because I love scones! Thanks, Abbe, I’d love to make these for you sometime! These are perfect for fall! Scones are one of my faves!!! pumpkin scones with the maple glaze was so wonderful…. Bookmarked the recipe……. The scones look so tempting. Would love to lay my hands on some. Love the maple glazing on top. Another delicious and irresistible fall treat. 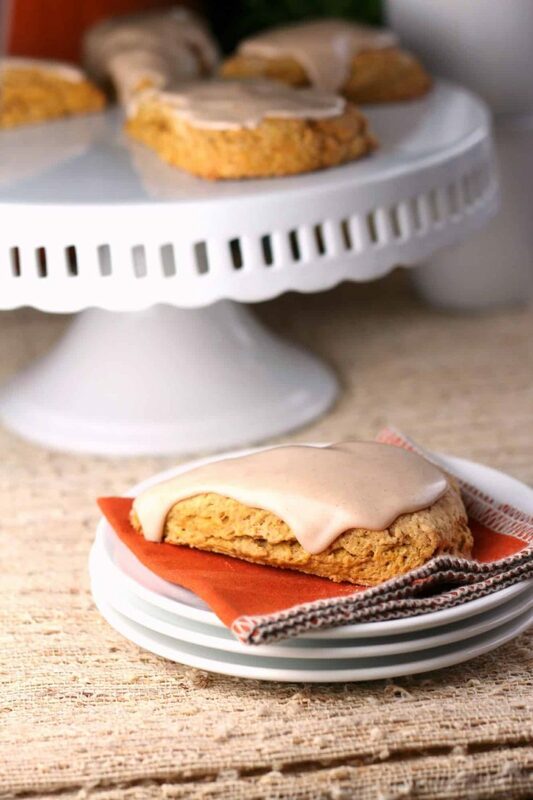 Yummy looking pumpkin scones. Love the glaze on top. Thank you, the glaze might be my favorite part too. wow – all those spices – this must have tasted awesome! These look to die for. Pumpkin and maple is such a great combination. I’ll never say no to a scone, especially one with flavors like this. What a wonderful marriage of flavours!! Pumpkin and maple – super!! Love the scones Holly!